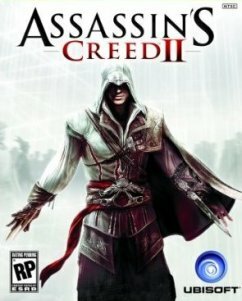 When Assassins was released in late 2007 it set the gaming world alight receiving much critical acclaim and with the story left in many ways incomplete it made sense to make a sequel so, two years and numerous awards later Ubisoft are back with Assassins Creed 2. The fact that there was going to be a sequel is nothing new (we have known that since last November) and it was officially announced with a teaser trailer and a bit of information in April but at E3 2009 we’ve finally got a good look at what it will be like with a 4 minute trailer and 6 minute demo — and it’s mouthwatering! So, what’s new? Well firstly we are in a completely different age — whilst the first had Desmond going back into the time of the crusades the sequel will see him delve back into Renaissance Italy covering the city of Venice. You’ll be playing Desmond’s Italian ancestor Ezio Auditore da Firenze who, although of noble blood, is forced into a plot against his family after he suffers ‘a great loss’ and ends up walking the way of an Assassin. This merchant start is very different from that of Altair, and the transition into the world of murder and conspiracy will be one that will make a more compelling plot. But don’t expect this to be identical to the first one — although it will be similar in many ways Ubisoft have had a look at the main criticisms of the first game and have tried to address them. These include some of the awkward controls, the way in which you are told what to do, the repetitive nature of the missions and the stupid fact that he can’t swim (which let’s face it would get annoying in Venice). Variety appears to be the keyword — with more than 16 unique types of missions resulting in over 200 missions, overall the game should have substantial playtime as well as maintaining interest, there are more ways to assassinate as which not only makes it interesting but also a little gorier as shown by the double face stab in the demo! Likewise, the AI characters are also more diverse, offering not only the ones that point and stare, but ones that follow you when they are suspicious, and ones that can seek you out of previously safe spots. However dealing with them shouldn’t be a problem, there will be over 30 different weapons (including 6 un-lockable ones via the PSP and PS3 connectivity) and added to that you will be able to disarm your opponents and use their weapons against them. But you will not only have weapons, but you will also have the ability to hire others to help you and get assistance from the most revered man of the time — Leonardo da Vinci. He will design many ‘gadgets’ to help you in your missions including smoke bombs and the infamous flying machine both of which are shown in the demo. All of these things come together to make a game that not only consolidates the best bits of the first game but hopefully also improve on the parts previously lacking in quality and continue the story in a way that will keep us all engrossed (you may also be glad to hear that Desmond will be doing “more than just lying down!”).